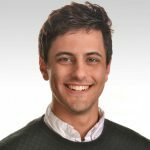 Jake began research with the Brown University BrainGate team in the fall of 2017. He is interested in sensory feedback in the context of brain-machine interfaces and the application of novel effectors in assisting individuals with tetraplegia. Jake received his BS in Biomedical Engineering from the University of Rochester in 2016. In the year prior to coming to Brown, he worked in Gothenburg, Sweden as a Whitaker Fellow under Dr. Max Ortiz Catalan in the Biomechatronics and Neurorehabilitation Laboratory at Chalmers University of Technology.